In recognition of the richness and uniqueness of Thailand’s artistic expression, SEA Junction has initiated a long-term collaboration with former stylist and Thai art designer Kwanpoom Vilaival. This consists of bi-monthly workshops to explore Thai culture and realities through painting and other visual arts. After focusing on silk-screen printing created from Ayutthaya Stencil patterns, at the workshop on 21 April at 1.30 PM-4.30 PM participants can learn how to draw on post-cards various types of birds from ‘Lai Rot Nam’ ((Thai: ลายรดน้ำ or gold-gilt painting on lacquered surface) decorations from the Ayutthaya period. The Lai Rot Nam art form emerged and became well-known during the Ayutthaya period during the seventeenth to early eighteenth centuries to embellish wooden furniture, especially cabinets, and wooden structures in palaces and Buddhist temples. The name derives from one technique used in the process. In Thai, Rot Nam means ‘watering’ or washed and refers to the washing away of excess gold leaves after artisans have finished covering the lacquered surface. It is at that moment that the beautiful paintings underneath will surface. The drawings of birds that will be used in the workshop derive from the most famous Lai Rod Nam art piece, a cabinet fully covered with Lai Rod Nam decorations on each side that is now at the Bangkok National Museum. Many have studied the cabinet trying to understand the still unknown parts of the process and identify the drawings lines. Kwanpoom among them uses a particular style with ordinary drawing pens to draw the invisible outline of the masterpieces – what he describes as a re-imagination of the legendary. At the workshop, he will share these ‘re-drawings’ and guide participants in drawing them on large post cards. 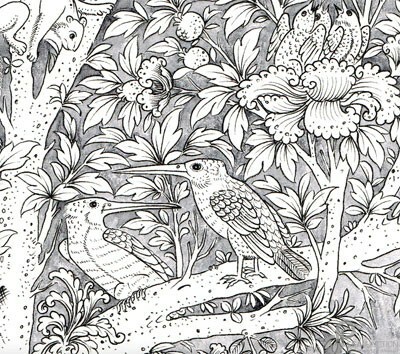 For this workshop, the theme of birds has been chosen, as they were often used for decoration with a great variety of motives. The workshop will be given by Kwanpoom Vilaiwan from Artizan Press who learned art design with masters Pairoj Teeraprapa, M.L. Chiratorn Chirapravati and Prateep Sawangsuk at Siam Sarm Tri Schools. He has experience in publication, design work, and fine art painting. He founded Artizaan Press and has edited more than 10 books, and 100 pieces of publication including, academic journals, chart books, scrapbooks and greeting cards from the work of famous Thai artists. His design work is both for commercial and non-profit aims including for supporting HIV patients from the Thai Red Cross, and for Bangkok National Museum, and Museum Siam. In his design work, the dominant color is the ‘Indian Red’ from soil pigment, which has been used since prehistoric times in Petchaburi province, including in the Wat Yai Suwannaram temple. temple. He has also written and printed books in Thai about the decorations of the temple that are available at SEA Junction.